Perhaps you’ve never heard of Phoebe Ann Mosey, born in Ohio on Aug. 13, 1860. Or rather, you probably have, but not by that name. You might remember her as woman who would go on to become a noted sharpshooter in Buffalo Bill’s Wild West Show, more commonly known as Annie Oakley, a woman whose story is so fascinating even 153 years later that I was thrilled to include her in an iHomeschool Network celebration of noted August birthdays! Phoebe Ann “Annie” Mosey (who last name was also sometimes noted in records as Mozee, Moses, Mosee and Mauzy) was born Aug. 13, 1860, in Ohio. After Annie’s father passed away when she was 6 years old, she started helping the family in any way she could – including hunting for game, which is where she developed her shooting talent. She sold extra game that she trapped and shot, and by the time she was 15, her income helped pay off her mother’s mortgage. The same year, a touring marksman brought his “shooting show” to a local hotel. That marksman, Frank Butler, often promoted his show by doing a marksmanship contest against a local shooter. Well, I bet he was surprised when the hotel’s proprietor put him up against a 15-year-old girl named Annie – and Annie won! The two sharpshooters were quite a pair. They eventually married, toured together (at times with Frank getting “top” billing and at times with Annie taking the lead and Frank as her manager) and grew older together. When Annie died on Nov. 3, 1926, Frank stopped eating in his grief, and he died just a few weeks later on Nov. 21. Among the many things Annie Oakley was famous for included touring with Buffalo Bill’s Wild West Show, along with Sioux chief Sitting Bull. Sitting Bull was a friend of Annie’s, and he gave her the nickname Little Sure Shot. Annie also knew another celebrity of the time, as it were: Thomas Edison. In 1894, he made one of the first “movies” by filming Annie shooting; you can see that here! There have been a variety of books and movies about Annie’s life, some much more realistic portrayals than others. The most famous, the Broadway musical Annie Get Your Gun, is also probably the most loose adaptation, but certainly still interesting! Check out some basic Annie Oakley information on Wikipedia. The Annie Oakley Foundation is a nonprofit started by Oakley’s grandnieces in the 1980s to help spread information about her true life story. The Buffalo Bill Historical Center of Cody, Wyoming, offers this detailed biography of Annie Oakley. Our family studied Annie Oakley and some other noted figures of the “Wild West” in late 2012; you can learn more by checking out Sarah’s poster about famous Wild West cowboys. 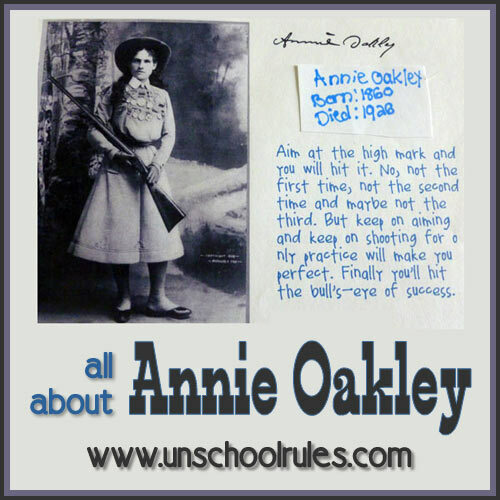 My friend Aadel of These Temporary Tents shared about Annie Oakley during last year’s iHomeschool Network August birthday celebration; you should check out her Little Sure Shot Annie Oakley post, including free notebooking pages. We spent a lot of time last year talking about “cowboy and Indian” times. Along with that, we touched on issues ranging from the current state of Native American reservations to the role of women in the West to the discovery of gold in California and beyond! 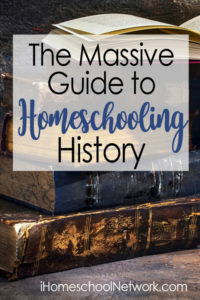 Here are a few ideas based around what we learned of Annie Oakley to help your family dig deeper! Reality vs. tall tales. Annie Oakley’s accomplishments sometimes were portrayed as almost larger-than-life. Yes, she was an amazing shot, but even the most amazing of her feats, like shooting the ashes off a cigarette, have been exaggerated in retellings. Her family members started the Annie Oakley Foundation to help prevent the spread of misinformation. What are some “tall tales” you’ve heard about someone famous, and what’s the true story? Women in the West. (And, really, women’s history in general!) This is a fascinating topic, and Annie Oakley is definitely an example of a woman who was allowed many freedoms that weren’t common in her time! Even so, she was denied some opportunities because of her gender; in fact, during both the Spanish-American War and World War I, she’d offered to lead a regiment of female volunteer soldiers, and also offered to train the (male) soldiers to shoot, but she was turned down. That’s a topic worth discussing: How has that changed in the past hundred-some years, and what issues still remain? Being “rich.” Touring with Buffalo Bill’s Wild West Show and performing in other ways left Annie Oakley a wealthy woman. In the end, it was discovered that she spent all of her earnings on her family and on a significant variety of charities and causes. What would you do if you were really wealthy? What causes would you support? And thanks for stopping by to help me wish Annie Oakley a happy birthday! This entry is about books, famous birthdays, history. The previous post was What our introverted family needs you to know. The next post is A birthday celebration: Small steps and giant leaps from Neil Armstrong. This is a wonderful study. I love how you have branched out in so many directions. I have never thought to study Annie Oakley. I love the notebooking page at the top. Is that Sarah’s handwriting? It is beautiful.